I recently picked up a number of OC razors and while I love shaving with them, I've been finding that the resulting shaves have been very aggressive - by that I mean the shaves leave my face feel raw and painful to the touch. I've tried going slowly; paying attention to my angle, pressure, etc. While this results in a better overall shave (BBS!) the painful sting caused by alum after the shaves brings me to my knees. I've mainly been using Personna blades, I will try other brands of blades but what makes a razor aggressive? Is there something I can do to mute the painfulness of the shave? Is the cause of the aggressiveness of the razor because of my technique or are some razors inherently more aggressive? Thanks for any help or advice you can offer! Any weepers, nicks or razor-burns? If not, you might want to simple skip the alum - some just react stronger to it than others. In my opinion, there is two major factors in what makes a razor aggressive; blade angle and blade gap. The design of a DE has an influence on its aggressiveness, more or less blade gap and exposure. You could try different blades to see it that makes any difference. The best way way is to refine your technique to where it is good enough for an aggressive razor to be used. That usually boils down to weight/pressure and angle. Think weight of the razor only for pressure. The lather had better be very good too. It could be a myriad of factors, but if you had been getting good shaves with closed-comb razors, then you may want to experiment with different blades in your OC ones and see if it improves the shaves. If not, then the OC ones may not be for you. I had thought I love OC razors, but soon realized that they were just a bit less smooth or a bit harsher than the closed-comb variants ,for my skin. I am sure I could have modified my technique, but the shaves I get with my Weber DLC are just so nice! I can't speak for others, but for me the elusive factor was pressure. When I thought I was using as little pressure possible, in short order I found I could go lighter still. Same with the angle of attack. I think I just got more sensitive to what I was doing with more practice. Then again, could be OCs are not for you as celestino writes. Either way, do what is comfortable for you, and don't be surprised if your favorite razors change over time. Some DEs are more aggressive and demanding of the user than others. If you can't or won't accommodate the razor by modifying your technique to suit it then it simply is not for you. Thanks for the help guys. So far, my favourite razors are Merkur 34HD and Gillette Techs. The 34HD requires no caution whatsoever; ever shave is virtually BBS and angle doesn't seem to matter. Great razor, but I like a challenge. I bought some OC NEWs assuming they would be like the SB techs, but they are a lot more aggressive. My first few shaves with the NEWs left me hamburger faced, nicks and weepers everywhere. But I'm stubborn and refused to let them win. The last shave was great, very little pressure and I was mindful of my angle. A great shave, but my neck had a lot of razor burn/irritation. My lather might need some work, I can never seem to get the consistancy right. Either it's too runny or too creamy. I keep a short beard/goatee so creamy lather makes it hard to see where not to shave and runny lather makes that aspect easier, but doesn't provide my comfort during the shave. (04-16-2014, 09:10 AM)Starkicker Wrote: Thanks for the help guys. So far, my favourite razors are Merkur 34HD and Gillette Techs. The 34HD requires no caution whatsoever; ever shave is virtually BBS and angle doesn't seem to matter. Great razor, but I like a challenge. Yea, I find the Gillette OCs a bit aggressive too so that fits nicely with you wanting a challenge then. Seems all is well there. You sound like you are on your way to taming the OCs by the sound of that last shave. You might want to lighten up even more on the pressure though. I struggle to get the lather just right too but I use a different soap every day and usually a different brush too so don't really get to know a particular soap or brush that well. I can say that when you hit the lather just right it does go a loooong way to getting a comfortable shave. How are you lathering? Tell us more. Are you using Marcos method, or are you tightly controlling the water? Face lathering or bowl lathering? The NEW isn't a very aggressive razor IMO so its probably technique. I'm guessing too much pressure or lather. Pressure is easy for us to explain, but not so easy to actually believe. When you think you're using no pressure, use half of that. Then do it again. Looking closely in the mirror you should NOT see the razor depressing the skin. Pulling the skin in the direction of razor travel is to be expected, but not being depressed inward. It's counterintuitive, but unlike other razors a bladed razor works best with NO pressure. Just enough to keep it from bouncing and "chattering" over the skin. Think of it as a very light caress. If you knew how incredibly sharp the blades we use are, you'd use very little pressure. 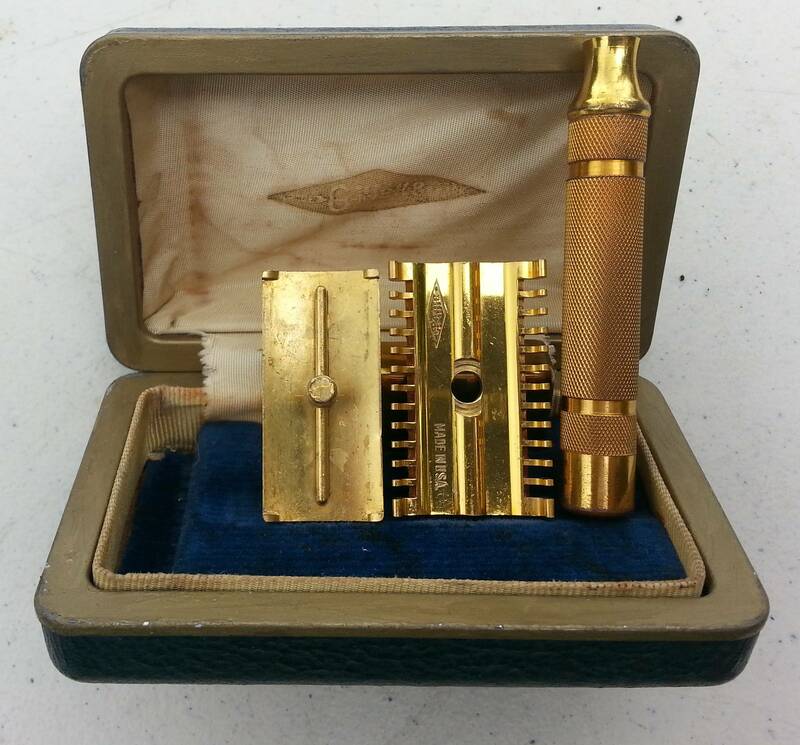 Make believe it isn't a safety razor, but one that with too much pressure will cut through to the teeth. I told my buddy about pressure for months and he told me he was about to give up when one shave he decided to actually do what I'd been telling him, "Use extremely little to no pressure". He called me that day and the first words out of his mouth was,"When you say use no pressure you really mean no pressure , don't you!?". He got it (finally). No pressure is what saves the skin, and gives the best shave. You asked if it can be made less aggressive. I know of no way. It can be made more aggressive, but not less. At least by non-destructive means. OK, back to lather. It's a critical technique for a great shave. The only time I ever got razor burn was when I knowingly used terrible lather... cause I was a super duper experienced shaver don't you know. Did I ever regret that hubris! However you're lathering, use more product. It's the single most important basic thing that anyone can do for a really great lather. OK, so if you're using (just to make up numbers for comparison) a 10 second load time and you move to a 30 second load time (add water as required) you'd expect 3x the lather right? Don't do that. Fully hydrate it, but don't fully aerate it. Aim for the same amount of lather you used previously. You should wind up with a dense, slick, protective lather that will be exactly what you need to shield your skin from the blade. Some of us call it an ultralather. Using an UL doesn't mean other parts of technique can be ignored. Pressure is still extremely important. But with a Tech, frankly, if your angle is off, it's no big deal. You simply won't get a shave or razor burn. The angle on a Tech is so small a window it's simply no big deal if you're off. The whisker removal will suffer, but not your skin. The aggressiveness of the razor is about as low as you can get. One thing you might do is to add a shim to the Tech, to get a sort of mid aggressiveness between the NEW and the Tech. I had a poor experience with my Bostonian OC. Then I changed to a milder blade (Lord Platinum I think) and adjusted to a steeper angle (more parallel to the face) and found that I got a decent shave. I am now going to work back towards a feather or personna med prep blade as I felt that the milder blade was holding back the razors potential. I'm also doing the first pass with the OC and finishing the remaining passes with safety bar as I get used to the OC. (04-16-2014, 01:46 PM)RunWithScissors Wrote: I had a poor experience with my Bostonian OC. Then I changed to a milder blade (Lord Platinum I think) and adjusted to a steeper angle (more parallel to the face) and found that I got a decent shave. I am now going to work back towards a feather or personna med prep blade as I felt that the milder blade was holding back the razors potential. I'm also doing the first pass with the OC and finishing the remaining passes with safety bar as I get used to the OC. The Bostonian is a NEW-improved head, right? For my NEW-improved Tuckaway, I used the same approach... a smoother, less sharp blade at a steeper angle. DORCO works for for me in my Tuckaway. To me the NEW is nowhere near as aggressive as the NEW-improved, so a sharper blade (Astra SP) at a shallower angle was a good match. An aggressive razor shaves closer, but it also makes more contact with the skin. Mild/gentle razors are made for sensitive skin. Another way to look at it would be that your skin has a threshold of self-defense beyond which a given razor may be too aggressive. My skin is very sensitive. (A more accurate word would be delicate or vulnerable, but that doesn't sound good.) So, I use gentle razors - in my case, gentler than the Merkur that you like. Interestingly, I get the best results with a mild razor and wet lather carefully built for maximal lubricity and minimal cushion. This gives me an easy cut with smooth glide over the skin and minimal damage. (If I use a more aggressive razor, such as an Edwin Jagger or a Weber, I make lather with a little more cushion.) I have to be careful not to get enough cushion to impede the cut or I end up applying pressure and getting more irritation. I've been shaving for over 45 years and I have been coming to these forums and practicing the enhanced traditional wetshave advocated here for over 8 years. I don't use mild razors because my technique is underdeveloped; I use mild razors because they match my circumstances. My thought is that aggressive razors might not be a good match for you. They certainly don't work for me. Here is a conundrum for you. My skin does better with mild razors and sharp blades, e.g. I use a Shavecraft 101 when I want a good shave and don't want to push my skin at all. I have learned to shave comfortably with some OCs that others find aggressive, but there is still a bit of sting from the alum. So how does one explain how I manage to get the closest and most comfortable shaves from a Cobra with a Feather Pro blade? I have no explanation. It could be that the Feather blades are simply superior to any DE blade. No one would call the Cobra mild, but maybe efficient is a better term for it than aggressive. Any thoughts? I don't know, matloffm. Usually when someone says a razor is efficient, I experience it as aggressive. Even so, some razors are more efficient than others while still gentle to the skin. My best example of this is the Mergress on its lowest setting, and I use it with blades in the sharper range (but not Feathers). I haven't used the Cobra or Feather Pro blades, so I can't speak from my own experience. Are you able to use this combination day in and day out? I have read about wetshavers using Feather straight razors and suffering an effect referred to as "skin thinning." I experienced something like this with Feather DE blades. In my case, the DE blades sliced right through the whiskers like there was nothing there and I got a very smooth shave with no burn felt or visible. However, even though I shaved every other day, I noticed that after each subsequent shave my skin became sorer and sorer. 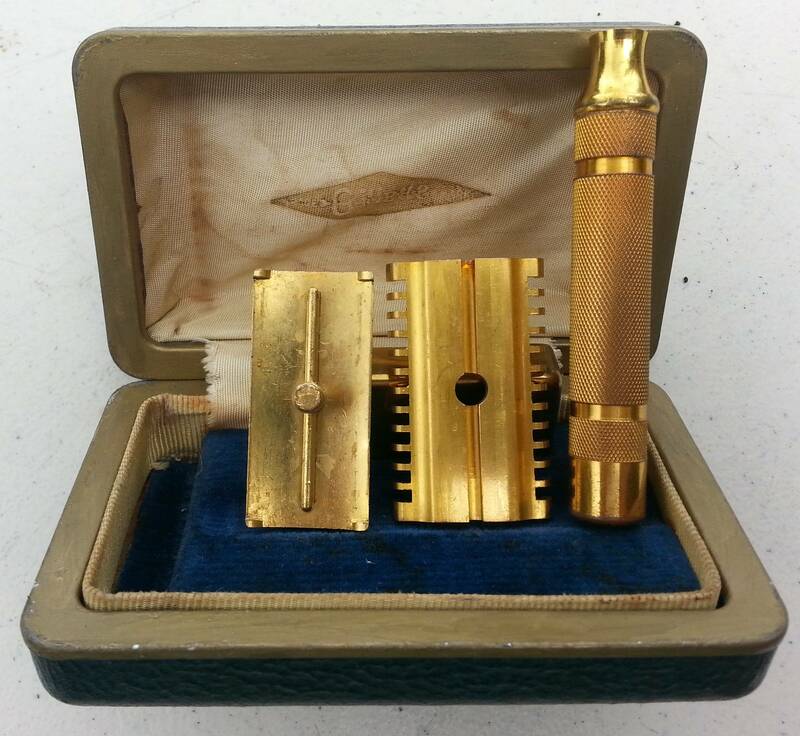 Feather straight-razor shavers observed that the more they shaved with this razor-blade combination on a continuous basis, the more they became susceptible to burn and small bleeders. It is impossible to account for all the factors in an individual's shave. If you have sensitive skin and you are able to use a Cobra razor with Feather Pro blades on a continuous basis, with no negative effects - and I don't question your word, I am amazed and I congratulate you. (04-16-2014, 02:05 PM)bjorney Wrote: The Bostonian is a NEW-improved head, right? For my NEW-improved Tuckaway, I used the same approach... a smoother, less sharp blade at a steeper angle. DORCO works for for me in my Tuckaway. To me the NEW is nowhere near as aggressive as the NEW-improved, so a sharper blade (Astra SP) at a shallower angle was a good match. Thanks for all the advice guys, it's very much appreciated. I'm still experimenting with soaps/creams so each lather isn't like the previous lather. If i'm using Tabac or B&M, the lather is always creamy and think, no matter how I make it (using Marco's method or a dryer brush and adding water as I go). For the sake of simplicity, I'm going to stick to one brush and one soap just to eliminate the lather from the equation. I typically load for 20-30s, or until my wrist gets tired. Typically what happens is that I get airy, foamy bubbly lather around the knot/handle area of the brush and a thick paste at the tips of the brush. I face lather exclusively, and start building the lather onto a wet face. I don't really add any additional water at this point, unless I feel that the brush is "sticky". I'm not really sure when I should be adding water, or what perfect lather looks like - I try to get the lather to sheen, but normally this means I have runny lather so I stopped trying to do that and just work with what I have. I didn't realize that a shallower angle was better; I had understood it that the SB/OC teeth and the tip of the cap should touch your face, that was the angle of attack while shaving. I will have to try a shallower angle and see how that fairs. I will also try to keep the pressure in mind. I thought I wasn't applying a lot of pressure but I will try to apply less and see how that goes. I also don't have any pre-shave process, I just take a shower and try to get shaving as fast as I can post shower. Would a pre-shave of some kind help? I suspect that I have sensitive skin, I'd like to shave every day, but my beard hair is thin and slow growing. If i'm using a tech and say Cella, I can shave every day without issue. If I use a tech and RazoRock Classic, I have to skip a day because the whiskers are just too small to cut and trying to shave leads down a road of pain and agony. The OCs so far have meant a shave every other day. I want to give them a fair shake before I decide if the pain isn't worth it. I used to be afraid of alcohol based splashes after a shave but after giving it a go, I love them. The momentary sting is worth it. Is there something you guys would recommend post shave? I typically use either Myrsol Emulsion or Institute Karite Balm. Not sure what else I should try. Murray: What do you consider milder razors? iKon three-piece with safety bars, first generation. My current favorite is the Mergress at lowest setting for the best combination of effectiveness/efficiency of cut and gentleness to the skin. Regarding lather, I very carefully and slowly build a lather with a tight structure and creamy consistency that is cushiony at first, but I keep adding water to reduce cushion and to promote lubricity and ongoing beard softening. Most shavers want more cushion in their lather than I do. Have you ever tried using a shave-stick, or just rubbing the puck of soap on your face? Works brilliantly! Do you have a pic of your lather? Good lather should typically look creamy and well hydrated with no bubbles. If you are face-lathering, you may want to do more paint-brush strokes to generate a better lather. Here is a very good video of Teiste, a member, here, face-lathering and generating a very good lather. He does it very well. So today's shave was much better; other than leaving my beard a little wonky. I tried to keep a shallower angle - this was easier to accomplish on my cheeks than on my neck; and tried to keep no pressure one the head. I used B&M Cheshire because I know I always get good slip and cushion with that soap and a Lord Platinum blade. My resulting shave was BBS, but around my Adams Apple it was raw. I got a few bleeders/weepers and the alum sting wasn't too bad on my cheeks, and was less painful on my neck but it was still more than I get while using a tech. I'll try to post pictures of my lather and will keep you updated if I make any progress.